A large scale study points to the protective effects of Vitamin D. Research data from the Institute for Translational Epidemiology and Associate Director for Population Sciences of the Tisch Cancer Institute at Mount Sinai revealed a strong association between low vitamin D levels and risk of death in general from cardiovascular disease and death from cancer in people with a history of the disease. In this study researchers analyzed data from a combination of European and American studies which examined 26,018 men and women aged 50-79 years. A sixteen year follow-up analysis revealed that 6,695 study participants died during the studies, including 2,624 from cardiovascular disease and 2,227 from cancer. A correlation was determined between people who had a low level of vitamin D and death from cardiovascular disease in people with and without a history of the disease. 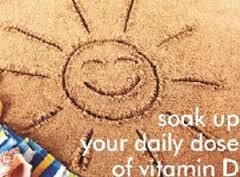 A similar correlation with low levels of vitamin D was determined in people with cancer and those with a history of the disease. No correlation was found between low vitamin D levels and deaths from cancer in those without a history of the disease. ← Chinese herb kills pancreatic cancer cells.